Adding a little extra to their ExtraMostBestest Pizza, Little Caesars releases the new ExtraMostBestest Stuffed Crust Pizza. 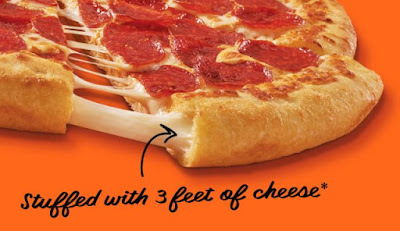 Available for a limited time, the pizza comes stuffed with over 3 feet of mozzarella cheese in the crust edge to go with the extra pepperoni and cheese that is the hallmark of the ExtraMostBestest Pizza. The price on the new pizza is $9 at participating locations (an extra $3 over the $6 ExtraMostBestest Pizza but roughly the same price as the Stuffed Crust option that select locations carry). The new pizza is available Hot-N-Ready from 4 to 8 PM and can be ordered normally outside those hours.